This generates an RSA-2 type key of size 2048 bits. These are the defaults and are considered secure. You can leave the passphrase blank but if you do this it means that anyone who gets hold of your private key file will be able to logon to the VM without a password. On the other hand, if you enter a passphrase you will be asked to enter the passphrase again each time you use the key. It effectively functions as a “super long password”. You should use a passphrase which is fairly long but easy to remember and with a mixture of upper and lower case. There are utilities available that you can run which means you only have to enter it once per session - see the section below, “Typing your PassPhrase only once”. You should name the file “id_something” because various SSH utilities pattern match against that. 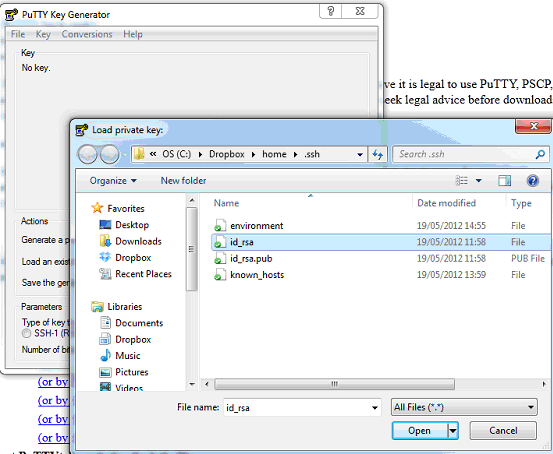 There are two files created – id_phil which is your private key - do not copy this up to any servers! - and id_phil.pub which is the public key which you copy up to Github or a VM. cat ~/.ssh/id_phil.pub | ssh root@NEWVM "cat  >> ~/.ssh/authorized_keys"
Adjust ‘id_phil’ and ‘root@NEWVM’ as appropriate. Pay careful attention to the punctuation! The right angle-brackets must be double as shown, or you’ll wipe out any keys you already have; and the quotes must be as shown, or you won’t get the desired result. Also be careful to cat the public file, not the private one, this is an easy mistake to make if you are using tab-completion to enter the filename. And hence runs keychain for both my personal and work ssh keys. This is considered somewhat insecure, but is fine for non-production use. See man ssh_config for details on how to restrict forwarding to particular hosts. There must be a line “X11Forwarding yes” for this to work. The -Y option supercedes the -X option. The -v is verbose help. To confirm that ssh is forwarding X11, check for a line containing “Requesting X11 forwarding” in the output. [Cygwin] runx                 # Start X server on Cygwin. Login to Bitbucket (you can do this using a Google login). Go to the Management screen, there you will see a page for “SSH keys”. Simply open the id_*.pub file and paste it in. Login to Github (you must use a UID and PWD to do this). Go to Account Settings, there you will see a page for “SSH keys”. Simply open the id_*.pub file and paste it in. Press Save Private Key and create the file “id_rsa.ppk”. PPK is PuTTY’s private key format. The PuTTY suite’s equivalent of ssh-agent is called Pageant. When started it appears in the notification area as a VERY small computer with a hat on! This variable must NOT be set for Cygwin or WSL, otherwise it interferes with normal git remote operations on those systems.